Blog Home | Backyard Chickens | Chicken DIY | DIY No-Waste feeder! I have an embarrassingly large number of chickens who eat quite a bit of food. (Let’s not get into actual numbers of birds I may or may not have, because then the chicken math I keep in my head starts to break down.) So when my friend Judi showed me her DIY No-Waste feeder, I had to make a waste free feeder, too! I love a good do-it-yourself project, so a DIY no-waste feeder — also called a waste-free feeder — was right up my alley! With most flocks, you have to deal with the issue of feed waste. It’s in hens’ nature to scratch at their feed, and that throws it onto the ground. My hens very much enjoy throwing their food around. On a good day, the smaller hens and bantams eat the food off the ground. On a bad day, it rains and the food is wasted. This waste-free feeder design really reduces the problem of feed waste because it’s so much more difficult to scratch food out. 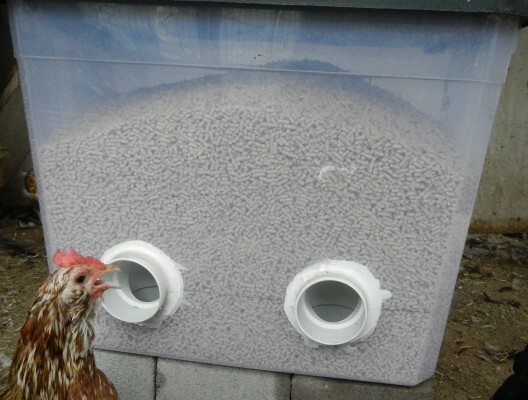 Of course, you can buy waste free feeders for chickens if you don’t have time for DIY projects—but I love chicken DIY projects! So here’s my version. A large container with lid. Note: I like the clear containers, so I can easily see when it needs a refill. However, the clear plastic will dry rot in the sun faster than other containers, so be sure to keep the feeder in 100% shade so it lasts longer. 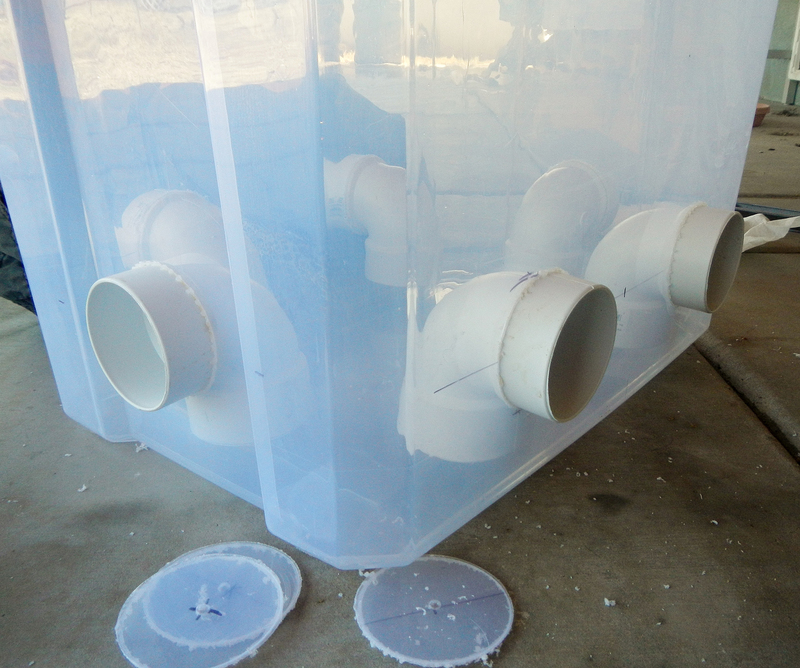 4-6 (depending on the size of your container) 3-inch PVC elbows (90-degree). Silicone caulk or NP1 caulk. 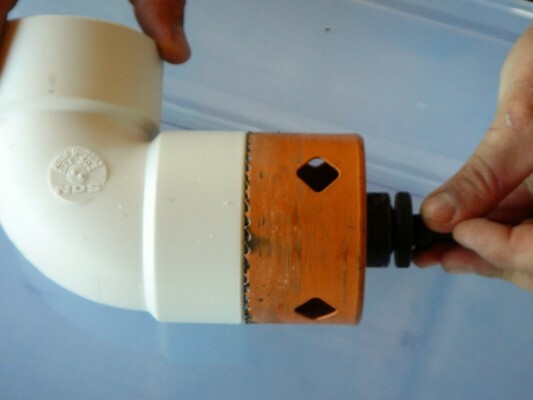 A 3.5 inch hole-saw drill bit. Something 1 inch tall, to help mark the placement of the elbow bends. My helper-dog is on the prowl for things he can interfere with! This is a pretty quick project, all in all, and can easily be completed by one person. 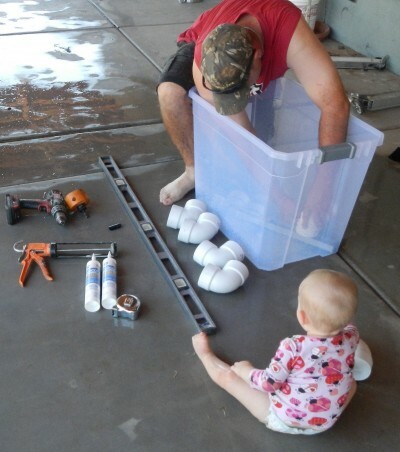 My husband wanted to help, which was great, because it was easier for me wrangle munchkins and take pictures! Step 1: First, use a level to measure where the elbows will go for your waste free feeder. You want the bottom of the elbows to be at least one inch above the bottom of the feeder, so the chickens have a “well” to peck from. Step 2: To make the holes, we used a 3.5″ hole-saw. Put your safety goggles on! A hole saw is a drill bit designed so you can cut perfectly round holes with your drill. As always, safety first! Action shot: drill bit and PVC elbow. You can see here why creating the right size hole is important for a snug fit. 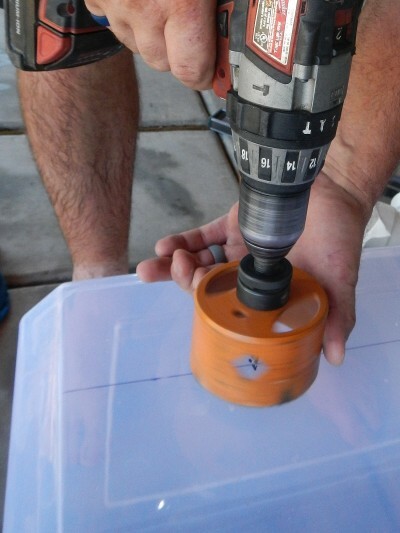 As you drill, be careful not to push too hard, as the plastic can crack. We found it was better to let the saw spin and warm up the plastic a bit, before pushing the drill bit through. Here you can see what it looks like not-quite-cut-through. A hole saw makes a nice, clean cut. Using other methods to make the holes for your waste free feeder can leave rougher edges that don’t fit snugly around the pipe elbow. Here we have snugged the elbows into the feed tub. Step 4. Carefully caulk the inside of the bends, to prevent them from slipping out. Then, use your finger to “moosh” the caulk in for a better seal, and let that dry completely. Next, caulk the outside of the elbows, and let it dry. There is some leeway as to hole size because the caulk will fill small gaps. To prevent the weight of the feed from pushing the elbows out, let dry overnight and do a second coat. We caulked the dickens out of them! Step 5. Finally, place the feeder, and fill it up. Make sure it’s low enough that your hens can easily reach, but not so low that it will attract mice or other pests into our coop. Our area is all orchards, meaning there are a lot of rodents around to attract! That’s why I wanted the edges of the feeder ports to be high enough that I wouldn’t be feeding a new generation. Total working time? About 20 minutes. Silly chicken! You can see my hen is not pleased with the “new big scary thing” in her coop. Still, it didn’t take her very long to figure it out! My turkeys especially love these types of feeders. This particular container cost me around $12 at Walmart, and is large enough to hold two 50-pound bags of chicken feed, with room to spare. A hundred pounds is a lot of weight pushing outwards on the side of the container. So,when choosing your container, be sure to note the thickness and quality of the plastic. The PVC elbows were ~$2.00 each at the hardware store. 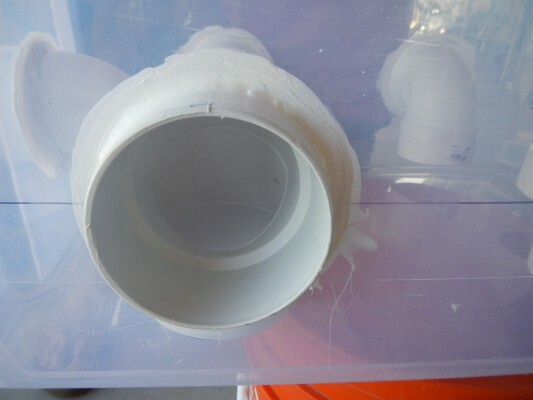 If you count the caulk used, this feeder cost around $25 to make. However, I’ll also save money on feed. Another thing to consider: if you have lots of chickens and not so much space, you may want more, but shorter, feeding stations. As my hens can free-feed out of this feeder all day, I haven’t seen any fighting for use of a particular opening. But particularly if you’re seeing feather picking/pecking, you’ll want to make sure there is space for everyone to eat at once. I hope you enjoyed my little DIY No-Waste Feeder project! We had fun making it, and the hens love it! Wow, great idea, looks very professional as well. Looks like it would be rodent free as well, is that correct? I use one of these! My feeder is a ( 2 gal?) detergent bucket that was cleaned and aged, and then turned into a chicken feeder. Because I knew I would use this type of feeder before I got chickens, I made ‘trainer feeders’ out of plastic bottles that they used as chicks, so they were completely fine when I upgraded them to their grown up feeder. There is no waste. Mine is elevated off the ground on a cement block inside the coop, and no mice have gotten to the feed. It holds about a third of a big 50lb bag of feed, and the hens like being able to stick their heads in and block up the hole so no one else can get to the feed till they are done eating. I’m thinking about adding a second and third tube/hole for them when I integrate the new chicks, so more than one hen can eat at a time. Cool to see it on Mypetchicken! I am new to raising chickens, and I would like to thank everyone on here. You all have great advice and great DIY projects! I am learning alot! 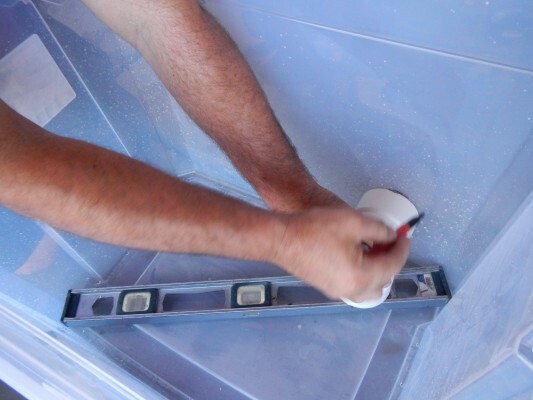 When choosing a container, also note that the sides should be straight up and down, not angled out. Very nice design. Some very small ventilation holes might be drilled around the top to allow moisture out and reduce the chance for mold in that amount of feed in the summer. Smaller containers would be great too, one for grit and one for oyster shell calcium. With a neat cover, like a mini pergola, it could be good outside too. I think this would work very well for our girls. And if a mouse was inclined to jump up into it to eat, our hens would get some excersize hunting it down. We have rats. Rats love to get into my chicken feeder which has a steel hog feed pan with a 5 gallon bucket attached supplying feed. The rats gnaw on the plastic bucket and it’s only a matter of time before they ruin my feeder and I’ll have to build another. Any advice on how to discourage rats from gnawing this feeder full of holes? Generally speaking, rodents are going to be attracted to any sources of feed they can get into. The best way to avoid attracting them in the first place is to remove food sources, as you probably know! You can see our advice about how to protect your flock from rodents on our website, and it includes–among other things–removing feed containers at night when rodents may feed (but chickens won’t), and using metal feeders and metal feed storage that rodents can’t gnaw through. For this project, switching plastic out for metal would make it more expensive and certainly less easy to DIY unless you have metal working skills such as soldering and/or welding. Instead, perhaps you could simply cover the outside of the feeder with hardware cloth, and be sure to remove it at night until the rodent problem is addressed. (I can’t picture the design of your current feeder, but wrapping hardware cloth around the plastic parts may work there, too.) 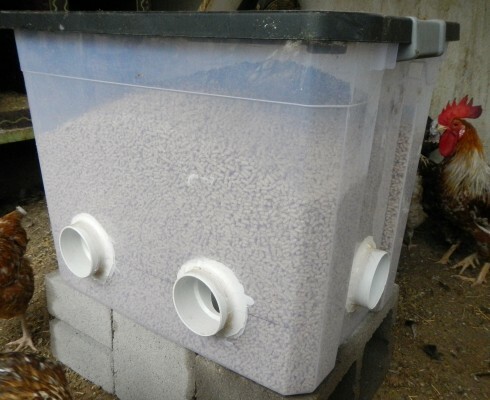 This No-Waste DIY feeder will also help the issue in that you won’t have waste feed scattered around in the litter to attract them! However, since you mention you’re on a farm, of course you’ll need to take similar steps with any other animal feeds you keep, and you’ll want to make sure your compost pile doesn’t have scraps, either. Please take a few moments and read through the advice at the link I included. I hope that will help! Use a 45 instead of a 90 for ducks maybe? Less angle. 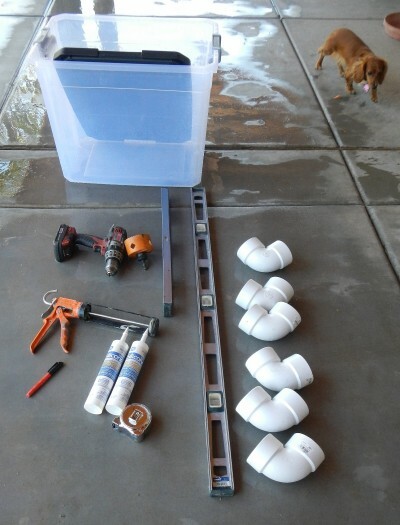 I am thinking of using this method with 5 gal buckets with lids. 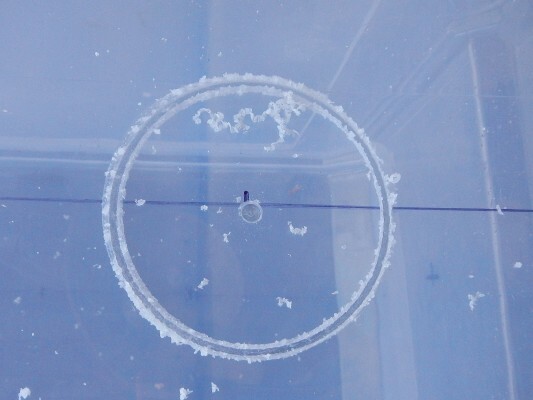 You can use a flat piece of plastic material (some scrap of some sort) and cut the same diameter of the hole in it to strengthen inside and out. 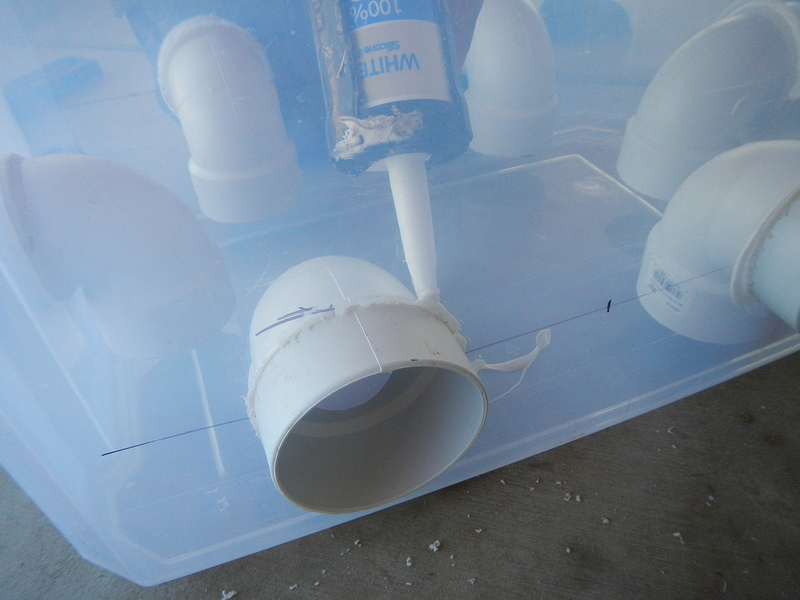 Add it when caulking but use a good plastic glue to make it stick all around. I wonder why a feeder company doesn’t use an idea like this? I’ve seen this same thing done by others too. Great write up! With such a big feeder don’t you get issues with mold on the feed? I take it you must have a LOT of chickens with so much feed available! Feed will not mold unless it’s exposed to moisture; it doesn’t really have to do with quantity (otherwise it would simply mold inside your feed storage container, too!). We do recommend keeping your feed in a sheltered area out of rain and even heavy fog. Many, if not most coops, have feeder (and waterer) space inside, which is ideal in most cases. Others have a sheltered run area that will keep the feed nice and dry. Thanks for excellent post. I followed this exactly to specifications and my girls (and boy) love it. We have 15 and they go through two bags in about 3.5 weeks. This is a perfect solution. Put it on cinder blocks under the shelter that covers the coop and no problems at all. Mice can’t get in it, and even the silkies can get their heads in. Combined with the automatic waterer I built, this means all I have to do every day is collect eggs! If you make a “short pyramid” out of plywood and put it in the center, it pushes the feed out to the sides where the chickens can reach, and stops there from being food in the center that can never be eaten. Where can I get the elbows? The only ones I can find are to long. I have one of these feeders made out of a 20 gallon foodgrade plastic. These are great for hens however my rooster died because he could not get to the food comfortably. It irritated his comb and wattle to the point he would not eat. I did not realize what was happening to him until it was too late. So beware, this may not be a rooster friendly feeder. Some roosters do have extra large combs, so it’s a good idea to double-check and make sure your chickens’ heads can fit in, easily. So sorry to hear about your rooster–you must have been heartbroken! I used you if a but for lack of space and more sturdiness, I ordered 4 1/2 gallon square buckets and smart hinge lids about $7 each. Used all the other recommendations and works great. Chickens have no problem putting head into pvc elbow. Started with 2 but now have ordered 2 more so we have feed to last longer. Great to prevent waste and less likely for predators to get to food. Your idea sounds great, don’t like waste.How much space do you leave from the bottom of container to the the elbow. Thank you ???????????????????????? We have 9 birds. 6 of which are California Whites. The other three are Old English mixed. My wife and daughter are concerned the chicken would eat themselves to death with this setup. The only chickens likely to have a problem overeating when offered a nutritionally balanced feed would be “meat” birds. They have been specially selected to grow fat fast. This is why My Pet Chicken doesn’t sell “meat” birds as pets, incidentally. It’s not that they aren’t personable; they’re sweet birds by all accounts. But they tend to be sickly from overeating, and die quite young if feed intake isn’t strictly limited. Other types don’t have this problem. Either way, though, the design of the feeder doesn’t cause overeating. A no-waste feeder just helps to prevent a lot of wasted feed knocked onto the ground. If you have a rodent problem, which most of do at one time or another, you can get caps for the end of the elbows, and put them on at night when the rodents come out. Solved my problem! Where did you buy smart hinge 4G buckets for $7 please? I use this feeder but would like to try making one with a smart hinge lid. Hi could you use this type of layout as a watering container as well. I have 30 hens. I’m looking for a setup that Can hold plenty of water. Thanks..great idea!! My hens are not sold yet, they still haven’t figured it out ..is elevating it critical? They should be able to easily get inside to get at the food, so the openings should be about at their shoulder height. If the feeder is at a level where they can’t do that without contortions (or at all! ), obviously, they’ll be much slower to use the new feeder. does this work for keeping the birds from getting the seed. Where were all these brilliant ideas 10 years when we 1st started raising chicks. I don’t even want to think about what every egg we’ve gotten has cost me in feed. Ha. I just built one of these feeders with my 10 year old son. He came up with using our hot glue gun for a couple of quick “tac welds” to hold the elbows in place for caulking. Just a little spot at 12 and 6 o’clock on the outside sure made it easier for caulking. I sure appreciate everyone’s feedback on feeders; now I want you all to get busy designing the perfect waterer; for both summer and 0′ F winters. I’ll be awaiting. It seems the elbows are in the wrong direction and not using gravity. Does this mean the chickens have to stick their head in and down to get the food? I just made this and my chickens haven’t figured it out yet!!! I am on day 2. I used a black container instead of a see threw one since I read it can be sun damaged. How do you get them into the idea of putting their heads in the hole?! Any suggestions are much appreciated. Hmmm… maybe perch some treats on the edge of the hole, and sort of scatter them back? It will take chickens a while to get the hang of it. However, they’re very food-motivated, so they should pick it up pretty fast once they realize food is in there! My chickens are pecking pieces of caulk off the feeder! Anyone else have this problem? I would hate to have to give up on this design after I spent all the money and time to make it. You would need to make certain that the younger chickens are large enough to reach the food. If their necks are too short to reach, it wouldn’t work. Thus it will depend on the exact age/size of your birds. Very small bantams will also have problems if the elbows aren’t sized for them. Curious – I am not Darin and I have no real idea about the toxicity of PVC (polyvinyl chloride) but I thought Dioxin was only released when burning PVC. It may have nothing to do with toxicity but the house we are building now has PEX (crosslinked polyethylene) delivering water to the outlets…since the well isn’t in yet, I don’t know if PVC will be used between the subsurface water and the PEX. I am not a chemist. I have no degree in chemistry. Both PVC and CPVC have lots of toxic stuff in them but it is my understanding that the toxin danger is primarily to the people making the PVC, not to the people using it – unless the PVC is destroyed – and since it isn’t digested by anything living on this planet I would think that would mean through thermal or chemical damage. I made a 4 at first then bought a new tub and more elbows and am using a 10 hole feeder for 20 chickens and it works great other than the boss chickens peck the others and have not let them eat much. I am hoping they will settle down. The only modification I made was I cut the bells off the elbows so they could eat a little easier. If you live in a cold weather area do the containers only last one year before becoming brittle? Just to help clear up this misunderstanding about the use of PVC for drinking water, the PVC is used nationally for COLD water supply and CPVC is used for HOT (or cold) water supply. I also have a feeder’s made from the large buckets with lids that come with the cat litter in them. I drilled the holes and used the pvc also. but I used a extra ring on the outside and the pvc glue to attach it to the inside pvc elbow. that way I didn’t need any caulk. been using them for 3 years and still works perfect. I have 4 buckets. they hold a 50 pd. bag of scratch grain. i’m collecting more buckets to make one for the layer mash. I got all my PVC supplies from the local farm and home store. Could you use this with Gunieas? They have a feed scattering party every time we fill them and this looks like it’d fix that! Anyone have any helpful hints on goat proofing a chicken feeder? I’m afraid anything I build will be destroyed by the goats trying to get the feed. Would this original idea work for water too? As long as the water level is not too high? The water would stay free of debris. putting red pepper flakes in with the chicken feed solves the rat problem and the goat problem. Birds cannot taste the peppers in their feed, but mammals (rats and goats) do and will be repelled by the taste. Some how my chickens are still wasting their food! We built this for them and there is still food all over the floor help! Do you still use this feeder and have you found any problems?